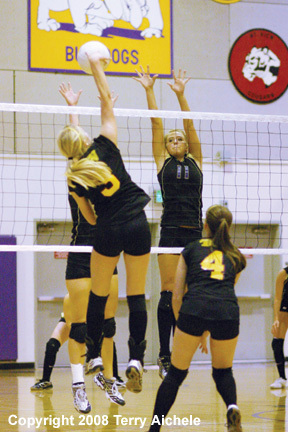 Hermiston's Kayleigh Barnitz blocks a shot by TDW's Makenzie Eliett during Tuesday's match. 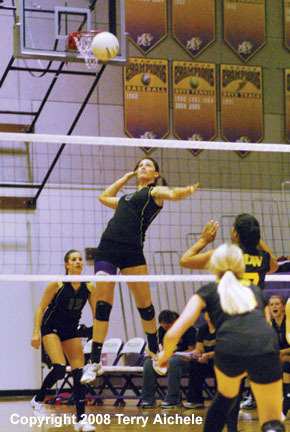 HERMISTON - The Hermiston Bulldogs hosted The Dalles Wahtonka Eagle-Indians in volleyball action Tuesday night. 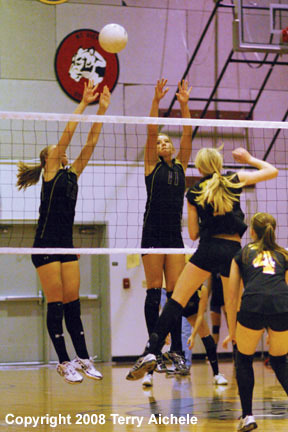 Hermiston won the match 3-1 with scores of 25-11, 21-25, 25-17, and 25-12. The second game saw both teams play solid volleyball. Hermiston took the lead right out of the blocks taking a 12-5 lead. The burst of points for Hermiston came during the serving of Mary Shae Hays as the Dawgs put together a five point run. The Eagle Indians put on their own burst when KT Clark served for a run of seven to bring TDW to within one at 14-15. The teams exchanged sideouts until they were tied at 18-18. Then Hermiston, during Jade Crossley serving, stretched to 21-18 lead. 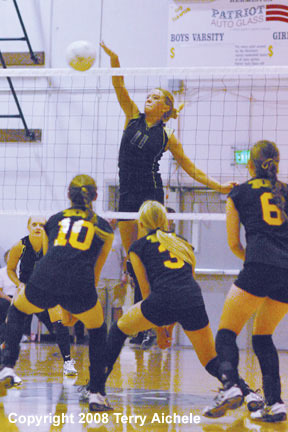 TDW came together and with Chelan Guischer serving scored six points in row to win the game 25-21. Game three was notable in that there were no long runs of serve. Hermiston took the lead at 7-6 and never gave it up for the duration of the game. The Dawgs finished with a score of 25-17. The fourth game had Hermiston in complete control of the game. Hannah Whitsett had a long run of serve from the midway point through a 24-11 lead for the Dawgs. Whitsett's serving included back to back aces. Hermiston won the game and match on a Dawg shot on a TDW serve for a 25-12 win. It was a good night for Mary Shae Hays, Hannah Whitsett, Jade Crossley, Kayleigh Barnitz and Amanda Bevington. They played strong and smart. Hays and Barnitz worked the net with great blocking and powerful spikes. 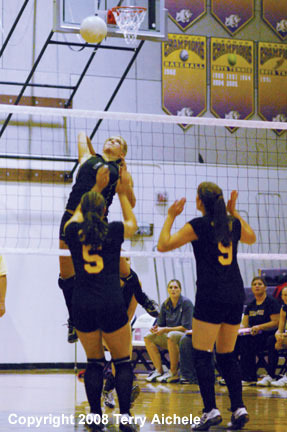 LEFT - Hermiston's Mary Shae Hays leaps high to hit a spike during the match Tuesday against The Dalles Wahtonka. 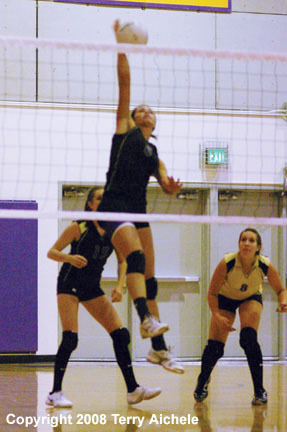 RIGHT - Hermiston's Kayleigh Barnitz winds up to spike the ball against TDW defenders. 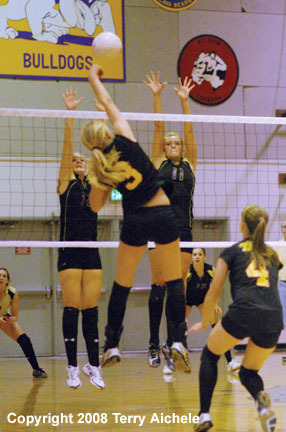 LEFT - Mary Shae Hays of Hermiston spikes the ball. RIGHT - Kelsey Martinson of TDW in the near court fires a shot towards Kayleigh Barnitz of the Dawgs. 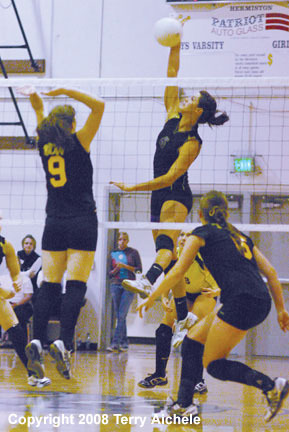 LEFT - Maloree Moss of Hermiston, on the left, blocks a shot by TDW. RIGHT - Maloree Moss, left and Kayleigh Barnitz in the far court go on the defensive at the net in preparation for a shot by Kelsey Martinson. LEFT - Mary Shae Hayes of Hermiston blasts a shot. 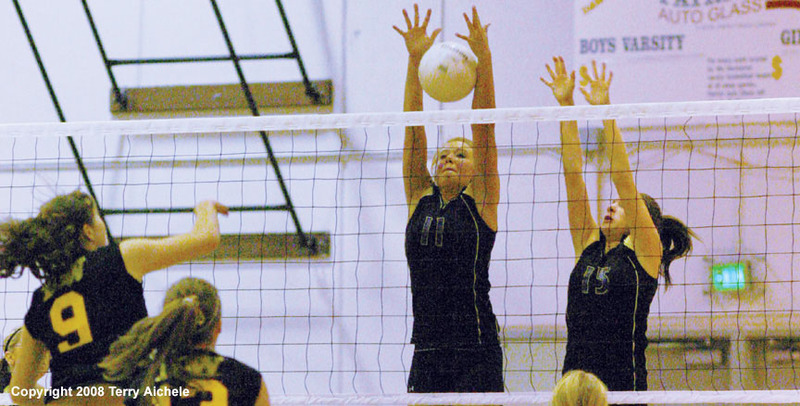 RIGHT - Hermiston's Kayleigh Barnitz tips a ball over the net during the match with TDW Tuesday night. The Bulldogs won three games to one.